Train for a Half Marathon with Us! Welcome to Fleet Feet Pleasanton Half Marathon (13.1 miles) Training Program. All trainees will get a 10% member discount on gear at Fleet Feet Pleasanton, valid from the program start date to the last day of class. A loyalty card will be issued at the first Saturday group run on January 6th. Tuesdays at 6:30 pm at Fleet Feet - Hill workout. Please Note: The first Tuesday is New Years Day, so we will have a special New year's Day run at 9 am instead of the hill workout! 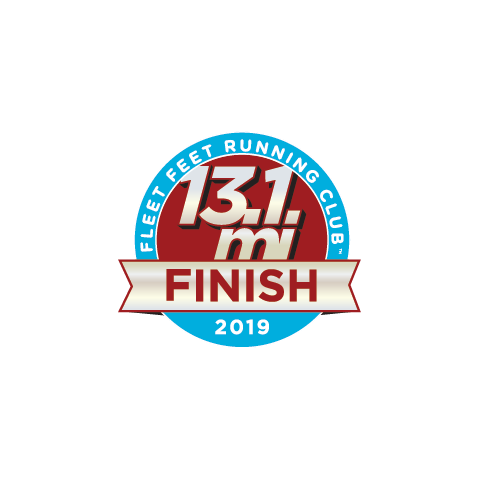 Goal Race: Livermore Half Marathon on March 3rd, 2019. Register NOW. The price increases December 2nd. Cost: $99. Cost does not include race fee. Program Requirements: You need to be comfortable running or run/walking 6 miles at a 13 minute pace or faster. You should be running 3 times per week, with a total of 15 miles or more, and must not be injured. This mileage is our first week of training and we increase from there. We know if you are comfortable at this distance at the start, you'll have more fun, be less likely to get injured and be successful! Registration closes January 7th or when class is full. Refunds or exchanges first week of class only.